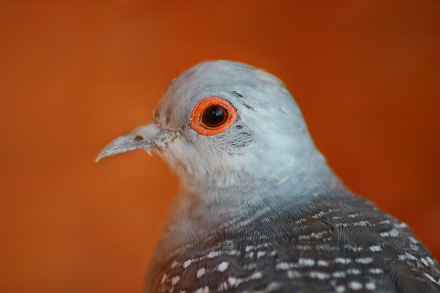 The diamond dove is a smaller bird from other dove species, and about a size of a smaller parrot. It looks gentle and cute, and its easy to separate males from females, as the male ring around the eyes is larger. This dove is native to Australia, and it is used to warmer weather. It inhabits desert regions of Australia so cold temperatures are not so good for this dove. 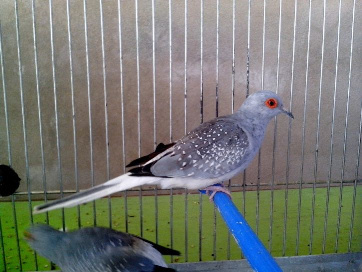 Diamond doves care is not hard, it need larger cages where they can fly and exercise. Installing two perches is important so doves can fly back and forth. Doves love to walk on the floor and provide them with this opportunity, and you can give them a bath bowl for them to enjoy. its good to get Doves (Complete Pet Owner's Manual) if you are a novice. Dove eat all of the seed and don’t crush it before, but can still make mess. Doves like to pick thru the seed and will throw some around. Dove mix is the best choice for these birds, and provide fruit and lettuce as snacks. Always provide fresh water at all times. These bird love to breed in open nests, you can get these nests in pet shops, or make a platform where you can install a place for the dove. Give them dry grass or straw and doves will use it for nest building, make sure eggs cannot fall from the platform. It is good to separate the birds for a few months every year so female can rest, to much breeding can shorten dove life span. Doves will live from 8-12 years if healthy. The diamond dove care is easy is a good choice for beginners that do the homework. It’s a mellow and kind bird, and favorite from lots of bird lovers.